qualified candidates for recruitment to the regular vacant post of teachers in Govt. & provincialized LP School pursuant to the advertisement made vide the office of the director of Elementary Education, Assam, Kahilipara letter no. EAA/SIU/3/2014/146 dated 30/10/2014 will be published on the 25th June 2016. 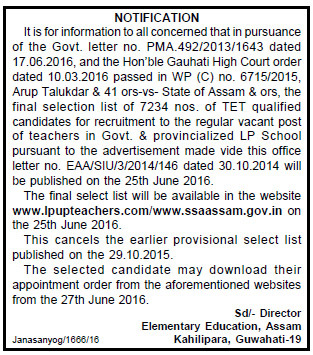 The final selection list will be available in the website www.lpupteachers.com / www.ssaassam.gov.in on the 25th June 2016. This cancels the earlier provisional select list published on the 29.10.2015. The selected candidate may download their appointment order from the aforementioned websites from the 27th June 2016. You can download the qualified regular teachers list form below.